Betty Boogie's Oddventure: OWOH - Blog Giveaway!!!!!! Welcome to my Magic Carpet, please climb on and enjoy the ride as you circle the globe exploring the wonders of One World One Heart! Welcome to my One World One Heart Giveaway!!! This is an amazing event organized by the talented Lisa of A Whimsical Bohemian. Thank you Lisa for sharing your time and energy hosting such a fun and wonderful event. At present there are over 1000 bloggers participating and there are still a few days left to join in. It is mostly a community of artists but any blogger is welcome to participate. To learn more, follow the link above or the badge in my sidebar. Check it out, you're sure to have fun and meet other fun bloggers and amazing artists and see their work. 1. Because this is an event designed to bring bloggers together you must have a blog. 2. Leave 1 comment on THIS post (please one comment only) By Midnight February 14th (Pacific time). If you would like to make it a little more fun, please tell me your favorite song. But this is not a requirement, just for fun. 3. Be sure there is a way for me to contact you, in case you are the lucky winner. 4. Winner will be chosen randomly on February 15th and will be contacted by email to get their mailing address. 5. Winner must respond within 2 days or another winner will be chosen. 1st PRIZE:I made these earrings, They are fiery orange cut glass beads with gold plated copper earwires. Also 1st PRIZE: This is a Flower hairclip I made from a velvet rose and a large salon quality clip. You can wear it in your hair OR clip to a hat or anyplace around the house. I have one clipped to my cloche and it is securely fastened yet quick and easy to put on and take off. 2nd PRIZE: Here is a similar one, a Rose but not velvet. 3rd PRIZE: A hairclip I made with chrysanthemums. My daughter Really wanted to do a giveaway so I am listing hers here, she will do a drawing from our comments as well, so now you have even more chances to win! 4th Prize Daughter has made a pretty rock star card and has paired that up with a sparkley Iron-on Electric guitar and a flower magnet she made. Best of Luck to you and Have a wonderful time on your Carpet ride!!! Don't forget to stop and visit again. Right now I am working on designing some clothes and an art doll and another fun painted toy for the kids, I can hardly wait to show you all! So please check back and see what I've been up to! Hi Betty! It's great to meet up with you again. So happy you are participating, and I absolutely ADORE the hairclips. :) My favorite song: that is WAY too hard because I like so many. How about a meaningful one: Hallelujah (by Leonard Cohen). Your floral hairclips are gorgeous and so are the earrings. My favorite song is Amazing Grace. WOW, I love your giveaway. The hair clips are so cool and would look great in my hair (if I do say so LOL). One of my favorite songs is Forever and Ever, Amen by Randy Travis. It is my husband and my "song". What wonderful and clever creations! Thank you so much for your giveaway! Swooping by from Alabama on my Magic Carpet ride. What an awesome adventure this has turned out to be. So many interesting people…so many talented artist and oh my…more than one or two kindred spirits I have found. When you take flight again, please come on down and visit me at Southern Ooaks #760. Have some SWEET Iced tea….look around and enter for one of my treasures from the heart. These hairclips are SO pretty! So cute, please count me in! Lovely goodies, Please add me name and come visit me at #978. Great giveaways, I'd love to wear those; please count me in and pop over to #5 if you have time. I love your choices of colors! Wow, so many favorite songs -- when I was in law school I chose a theme song, "I fought the law and the law won." Still makes me laugh. The earrings and hairclips are wonderful! Please include my name! Beautiful! I would love a chance to win! love the earrings and flowers! great giveaway gifts! Your giveaway is lovely. Thank you so much for adding my name for a chance to win.. Thank you for a lovely stop on the magic carpet ride. Hello Betty. I enjoyed your blog. Your giveaways are beautiful please count me in. Then come by my place. Oh please add my name to your giveaway. Please come by my blog #485. Wonderful prizes! Please count me in! Thanks for the lovely flowery giveaway! Cool earrings! Thank you so much! Please come to my blog and participate in my giveaway #626. Lovely prizes. The roses are so beautiful and also the earrings. Please add my name to the hat, Great Giveaway! What a ride! I love your flowers and your earrings! I am a hat person so flowers on hats are a must for me! Please enter my name into your draw -- thank you!!! Please count me in your wonderful giveaway! Enchanting Earrings & Flower Hairclip OWOH Giveaways! Lovely Blog. Love the flower hair clips! Haven't got a fave song -sorry! OMG! love them all! please come visit me too I am #886 on the "ride"
What a lovely giveaway. Thanks for making my carpet ride a great experience! So pretty. please enter my name. My favourite song is 'Nature boy'. Hi Betty ! Your hairclips are wonderful and I appreciate the chnace to win. My favorite song - boy that is so hard to choose as it chances so often. I guess one of my favorites of all time would have to be "Bridge over troubled water". I hope you have a fantastic OWOH adventure ! Oh, what fun! I must confess, I have always had a great fondness for Chrysanthemums- the one plant I never managed to kill. :P Roses are popular, I understand. But let's have some love for the mums! Glad you joined the Ride! It is so exciting to find such lovely blogs like yours on this Magic Carpet Ride! Please enter my name in your drawing then stop by for a chance to win my beaded bracelet giveaway! Hi Betty, what a lovely idea and post you have. I love the earrings and hairclips. I'd love to win. I absolutely love your gifts. Please take time to visit my blog, too, for a chance to win my book, 16 x MOM: A Mastery of Motherhood. I'm working on getting all the country flags. I promise to revisit your's too. lovely giveaways! please enter me in your drawing and drop by my blog too if you haven't. #955 on the magic carpet! Oh so beautiful! I love your giveaways. My favorite song is "Summertime" from Porgy and Bess. Love those hair clips! Thank you for flying the carpet caravan! Hi from Ireland. What sweet things you make. Beautiful earrings and hairclips! I hope I will own one soon! Come check out my giveaway as well if you have a moment! Wonderful colours. I love the earrings. Thanks for visiting my blog. Greetings from northeast Pennsylvania! Thanks for stopping by my blog to enter the OWOH giveaway. Your giveaways are beautiful. Would love a chance to win one of them, so please enter my name. I especially like the hair clips! My favorite song is morning song by jewel. So so pretty! Good for your daughter for getting involved too! I don't think I have an absolute favorite song, I love music and like to sing too. It was great to meet you and thanks for stooping the magic carpet at Loveleigh Treasures! Great creations, thank you. Please visit my blog #840 to see the felt flower brooch I am giving. Do you remember me from last year? I won one of your marvelous orchid hairclips which I SO love! When I don't wear it, it's displayed in my hall -- right opposite the front door! Thanks for offering such nice prizes this year again. Thanks for stopping by and checking out my Etsy shop! Loving your blog and all your beautiful giveaways. Wow, there are so many of them! Hey Betty, these are all so fun, please count me in. I couldn't list a single favorite song, but one that I'm listening to a lot lately is International Harvester by Craig Morgan. love the rock star card from your daughter! my favorite song is In Your Eyes by Peter Gabriel!!!! Thanks for visting my blog! Hope you visit again soon! I love that your daughter wanted to give a prize too...how fun. Thanks for the chance to win. 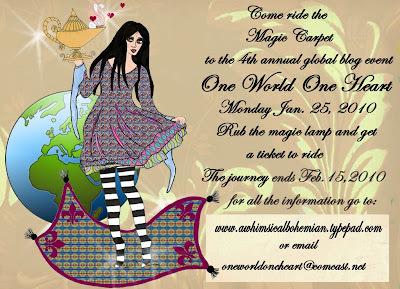 Please enter me~I am having so much fun on this Magic Carpet Ride! pleased to meet you Betty. The earrings and velvet rose look gorgeous. Such fun, gorgeous pieces; who doesn't like to adorn herself with flowers and jewels? I have lots and lots and lots of favorite songs (most from decades past), but the one that currently sticks in my head is Sinatra singing "Fools Rush In". Your giveaway is terrific! I would love a chance to win. Please add my name to your drawing! Thanks for participating in the OWOH event. I like Lennon's Watching the Wheels. Wow, so many lovely prizes! Thanks for the chance to win one! Thanks for stopping by my blog- I hope that you will come and visit again. Good luck in the draw for the bracelets. I think your earrings are lovely and the handmade flowers are magnificent. Hope your daughter has fun on her OWOH journey. I am not sure if I have a favorite song but I love lots of different kinds of music folk, rock, classical, country, world even some operas.. Please enter my name in your draw. The earrings and flowers are beautiful. Thanks for flying by to visit my blog, nice to meet you. thanks for visiting my blog on your magic carpet, and so nice to visit yours. your clips are very nice. Great giveaway. Those flower clips ROCK. Love them. I don't have a favorite song. I like too many styles to choose one only. I'm # 79 on the magic carpet ride. Oh wow... your gifts are beautiful! Great blog you have too! Please enter my name into your fabulous drawing for a chance to win. Sweet gift you are giving, I'd love to enter! If you haven't already, feel free to stop by my blog #135 and enter to win 1 of 3 give-aways! Nice meeting you...sending love and blessings from New Zealand! What a nice collection of offerings! Come see my tatted lace at #753 when you can. Sweet treasures!!! I would love to be the winner. Please include me and then come on over and enter my giveaway too! Thank you for this opportunity to join in on the fun! Thanks so much for offering all of these and for your kind comments at my giveaway (lifeunity.blogspot.com). I think I'll browse your blog a bit more - can't wait to see what I find! HI Betty,Thanks for leaving me such a lovely comment,i would like to be added to your owoh too. Hi Betty from Victoria, Australia. What lovely giveaways you have and your daughter too. I would be thrilled to win any of the prizes. Fabulous! Thanks for this great giveaway. Long live OWOH:) I hope to win. I have not one, but many favorite songs:) Especially of Nightwish, Epica, Lacuna Coil, After Forever, etc. Lovely giveaways (daughter's too). Please enter me in your drawing for these. Just wondering if you knew any moms that would be interested in the beautiful giveaway going on right now at www.freeprettythingsforyou.com? If you do please let them know! i hope you have a chance to stop by my blog too! Lovely giveaways. Please put my name in the hat! i been trying to find blank ones.. where did you get yours?? Hi Betty and greetings from Australia. Please come on by and visit #70, have a look around and enter into my draw. Great meeting you. thank you, they are lovely. #690 fly on by. hi Betty, what pretty earings, and I love hair clips! as to fave song, hmmm, I've never had a favorite song, but I do love my oldies, and I swear every day I hear something else and say it's my favorite. So I probably have hundreds of favorite songs, lol! What fabulous offerings! Please count me in on your giveaway. iris, right? That's my favorite flower. Please tell your Daughter that she did a beautiful job on all that she created. Please enter me and then when you have time stop by and enter my giveaway, if you haven't already. Such wonderful giveaway! I'd love a chance to win 1! What great giveaways. Please enter me! How fun looking, count me in please. Hi Betty! So many gorgeous offerings, please pop my name in the hat too. Your work is lovely and so is your blog. We would be SO excited to win! Thanks for having us over to visit. Really love those flower clips, Awesome giveaway! Thanks for the chance to win! Greetings from Maine. First of all, my favorite song is She's Always a woman, Billy Joel. What a lovely give away, please sign me up. Thank you. glad I stopped here on the carpet ride!